I got a little bit of time today, so figured I would tackle the newest Make it Monday Challenge on Nichole Heady's blog! Jenn Ellefson did a great tutorial on using colored pencils, something I've never really experimented with. I thought that the boys had some cheapo colored pencils in a big art set that they have had for years, so I went to find them, and lo and behold - found a 24 box of Prismacolor pencils instead! WOOHOO! I don't have any of the little blending tools that Jennifer used, so I improvised: I cut a Q-tip's cotton tip off and trimmed the stick a bit so that it came to sort of a dull point, and dipped that in Baby Oil to blend the pencils. It wasn't perfect (I'm sure the proper tool would work better), but it definitely did the job! 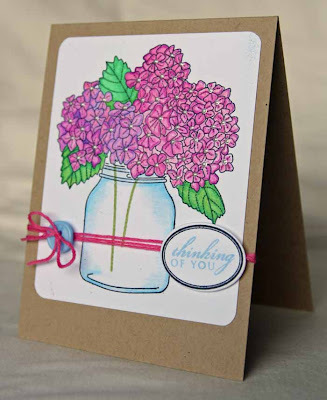 I used the flowers from Summer Jar Fillers in shades of pinks and purples with the stems from Daydreamer and a Little Label for the sentiment. 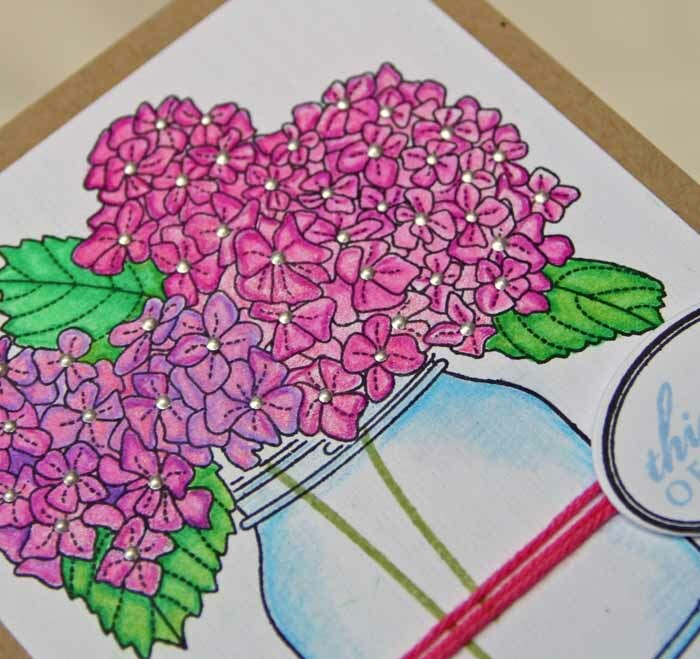 I added a teeny little dot of Liquid Pearls to the center of each flower. love your improvisation with the qtip..its all about using what you have.....i think it came out beautifully!! the flowers and the jar looks awesome! What, what a find scoring those Prismacolor pencils. They aren't cheap! I hope you hid them from your boys now. I love how you were so creative with the blending stumps. It looks gorgeous. Love this card Debbie, it's so pretty. 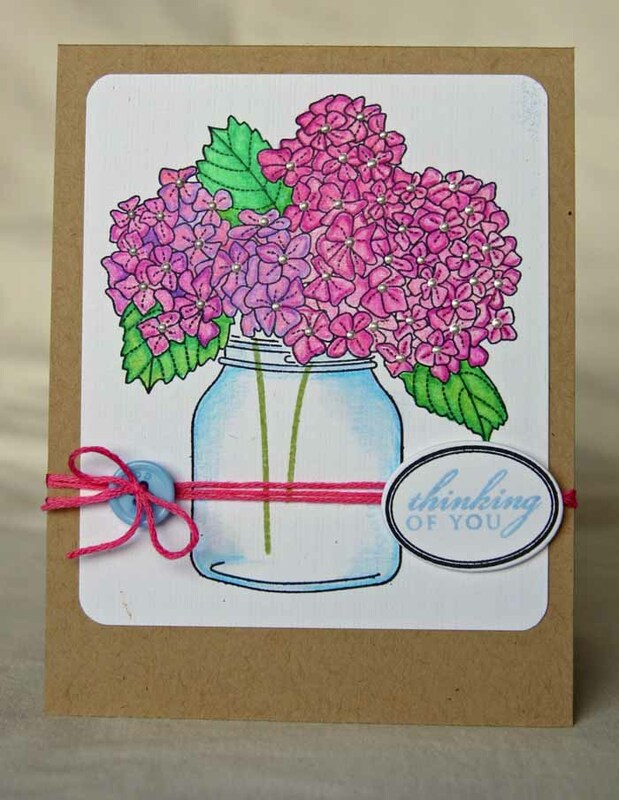 You did a wonderful job on the blending and coloring,the flowers look great in the smaller jar. The liquid pearl is a perfect touch! Beautiful hydrangeas. Love your improvising, I just bought a whole can of gamsol, and could have used the baby oil that has been collecting dust in my bathroom to blend. Well done! Great card. Beautiful coloring job. I'm surprised you didn't remember buying Prisma Color pencils--they are pretty expensive. I like how the blue of the sentiment echos the blue of the glass jar. This is beautiful. I used a cut up q-tip also when I first tried blending pencils. The paper stumps are easy to find at big box stores and aren't expensive. You should give your pencils some love again. You are great at it. Very pretty card. Your colors look great and I love the stem idea. Can't wait to use it with my set. Wow! That is a lot of coloring you did there! And so beautiful. Lucky you, finding the Prisma Color surprise!